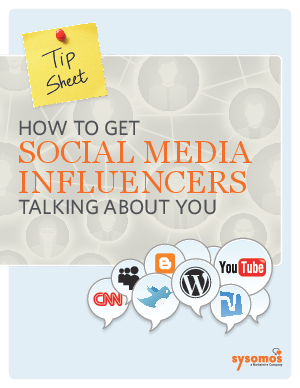 A social media influencer is someone who talks positively about your brand and products on Twitter, Facebook, Google+, Pinterest or any other social media platform. He or she can be anyone from a mom on Facebook who likes to mention her favorite products to a big-name blogger in your industry. Getting the right people excited and talking about your brand is one of the best ways to improve brand recognition, expand your customer base, and ultimately drive more sales. Word of mouth has always been the most trusted way for a potential customer to hear about your product. Social media makes word of mouth digital. Maintaining a database of your influencers that includes the size of their networks and other demographic information is a great way to create instant outreach lists for new product launches, news and deals. It takes some legwork, but will have an immediate payoff whenever you want to get your message out quickly. New tools make it easier than ever to find these influencers-but how do you bring them into your circle and get them talking positively about you? This paper offers 6 tips for doing just that.